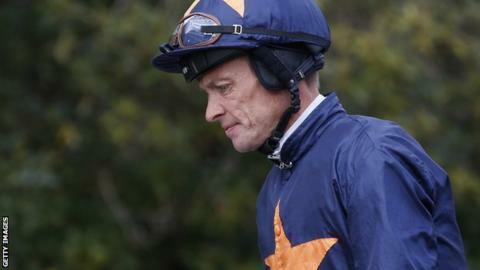 Champion jockey Richard Hughes is to retire earlier than planned at the Goodwood Festival in two weeks. The 42-year-old had already announced this would be his final season but said his move into training had hastened his decision to quit. "To be a champion jockey and to be successful you have to be totally committed," he said. "It's become clear in the last two weeks that I've realised what that [training] will entail." Three-time champion Hughes is poised to embark upon a training career as early as the autumn. "Hughes had said he'd be winding down riding commitments when the sales season - all-important for trainers seeking clients - got under way. "But that's from late August/September so this news is in one respect a surprise; equally though Hughes is a smart operator who wouldn't want to jeopardise any plans, so from that point of view it's no shock. "Meanwhile, with no Hughes for the final weeks of the title race, and probably no Ryan Moore because of injury, Silvestre de Sousa's odds on being champion jockey have shortened again. He said: "I have always given 100 per cent in everything I've done and I don't want to stop doing that now. "I always knew this was going to be my last year, and I'm comfortable with the decision [to retire after Goodwood]. "Whenever I was going to retire I was always going to miss out on riding good horses. Now is the time." Writing in his Racing Post Saturday column, he added: "If you have backed me to win the title, I can only apologise sincerely. "I really am sorry things have not panned out as I expected. The scale of what it is to come is bigger than even I had imagined."